On the morning of July 14, longtime Walton County, Florida resident Daniel Uhlfelder decided to go to the beach. Thousands signed, more needed. You can help! "All the beaches of South Walton and Florida have been uninterrupted in their human use for many centuries. A doctrine of “Customary Use” gives all of us reasonable access and enjoyment on private and public beaches." Customary Use is a big issue in the state of Florida. It’s the belief that beaches have been public property as long as humans have used them, which is why counties across Florida have passed customary use ordinances allowing access to both public access points and in front of beachfront homes. The Walton County Board of Commissioners is moving forward to restore public beach access along the South Walton beaches under new provisions of the House bill. Public Information Officer for Walton County Louis Svehla said the hearing is the first step toward a customary use ordinance. "Based on the legislation passed this year by the state of Florida, House Bill 631, it requires that we hold a public meeting regarding our intent to move forward with the customary use ordinance," he said. A draft of the ordinance will be presented at the hearing, Svehla said. "That would be the ordinance that would be presented along with all of the other information to a judge who would ultimately then decide whether customary use could exist in the forum that we’re trying to have." 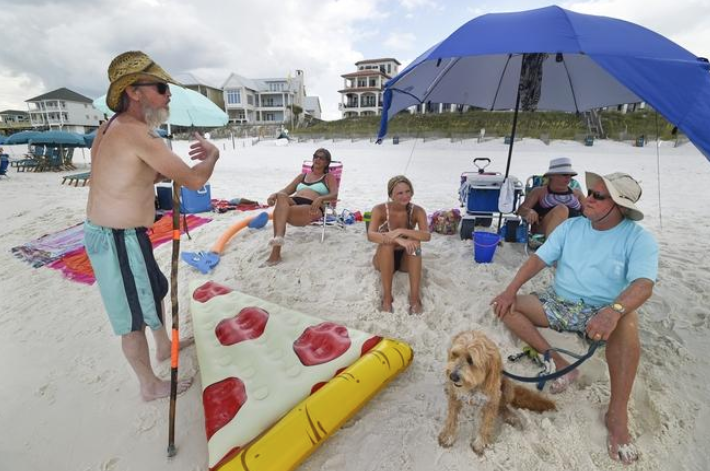 In 2016, Walton County Commissioners passed a customary use ordinance giving the public the right to enjoy privately-owned beaches without fear of prosecution. "We had issues with property owners putting up fences and signs and chaining off and roping off their private property which was an environmental issue as well," Svehla said. "And that really led the board to look at our beaches, how they’ve been used customarily; what they felt was right for this area." On July 1 of this year, HB 631 went into effect voiding the 2017 customary use ordinance and causing issues for both residents and visitors. "We’ve had several property owners say they do not want us crossing their property in order to pick up trash that we would normally pick up on private property throughout our beach," Svehla said. "That has caused us to have to stop picking up trash in certain areas. We’ve got about 70 percent of our private property now that we’re unable to collect trash from because we are unable to traverse certain areas of the beach." Another issue is, of course, the confusion of which beaches are public or private. "Certainly visitors coming in, even residents, who have been going to places they’ve been used to going to and being told by homeowners that they’re going to have to move — that it’s private property," Svehla said. Svehla said the proposed customary use ordinance will be similar to the one passed in 2017. "We don’t anticipate it to be much different," he added. "Really, this is the process we have to go through based on the legislation. So the board will look at a draft ... and if they would like to make any changes or see something different in an ordinance." And again, the Florida Legislature could pass another bill. "The State legislature could certainly pass something different," Svehla said. Svehla said the county is planning on a large crowd for the public hearing, which is why he advises anyone interested in going to arrive as early as possible. The public will be given the chance to speak at the hearing. A South Florida Democrat did much of the heavy lifting to guide HB 631 through a Florida Legislature dominated by Republicans. But state Rep. Katie Edwards-Walpole, D-98th, had input from a law firm that now represents Walton County beach property owners. Attorneys at Hopping Green and Sams helped influence Edwards-Walpole’s decision to amend HB 631 so that only Walton County would feel its impact. And the impact has been profound. 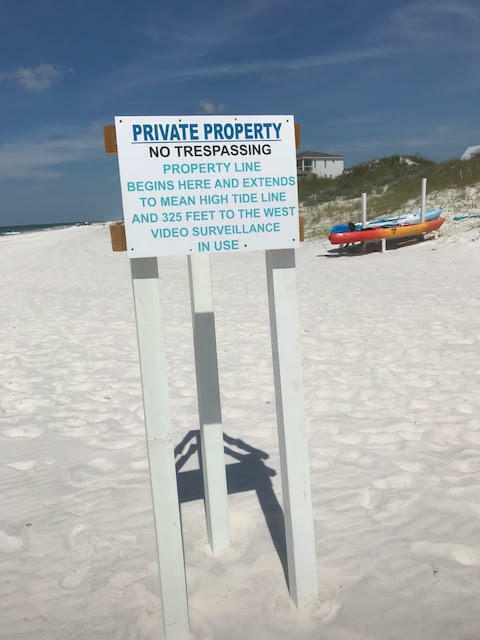 After July 1, when HB 631 went into effect, coastal property owners in Walton County began posting no trespassing signs and taking action to keep almost everyone, including county tourist development employees, off of the dry sand portions of beach to which they hold deeds. Proponents of customary use, the theory that beaches have been public property for as long as humans have utilized them, have taken offense at the private owners’ actions and are loudly disputing their claims that some portions of the beach are off-limits. Some have even begun testing the private owners’ assertions that they have the right to remove trespassers. Confrontations are occurring nearly daily between beachgoers and private property owners. Local law enforcement, faced with a quandary over enforcement of trespassing regulations, is often summoned to mediate beach front disputes. Walton County is alone among 67 Florida counties facing the controversy created by HB 631. Records show that sometime between November of 2017 and Jan. 11, 2018, HB 631 was amended to exclude Volusia and St. Johns counties — the only two Florida counties other than Walton to have established customary use ordinances — from the bill’s provisions. While Walton County’s customary use ordinance was shredded by the bill when Gov. Rick Scott signed it into law, Volusia and St. Johns ordinances were allowed to stand, seemingly simply because they were adopted before Jan. 1, 2016. On Jan. 9, an email was sent from attorney Gary Hunter at Hopping Green and Sams to Edwards-Walpole at the firm of Saul Ewing Arnstein and Lehr, her place of business in Fort Lauderdale. In the email Hunter states that he and “the lawyers litigating the Walton County case” feared that incorporating Volusia and St. Johns counties into HB 631 would spur more Walton County lawsuits. Before you get upset with us about today’s headline, let us explain. “Worthless” isn’t to discount their beauty, how much people want to use them or how much people pay to live near them. “Worthless” is about the actual monetary value of the beach when it comes to assessing the fair market value of property along the Gulf. It’s a real statement, not hyperbole, rhetoric or exaggeration. It’s not about projected sale prices. It’s about a calculation used to determine taxes paid on the land itself. Customary use has become a hot-button topic along the shoreline in Walton County. For those of you who haven’t been keeping up, on July 1 some beaches in Walton County became closed to the public through a new law, H.B. 631. Property owners whose deeds are marked to the mean high-water line gained exclusive rights to use the dry sand on their respective properties. Bottom line, if you don’t own a house on the beach or aren’t part of a homeowners association along the beach, the places you can go to the beach have been limited under this law. Customary use now is being claimed by several of the county’s residents. Customary use basically says that people always have used these beaches, well before anyone owned them, and that using these beaches is a right of all people. And, yes, it’s complicated. And, yes, people are angry. And, yes, it’s going to cost the citizens of Walton County all a lot of money to settle. But none of that money will come from property taxes paid by property owners for beach property. You see, this is about a lot of things — property rights, ego, beach behavior, money — but it isn’t about taxes. Whether your property line stops at the dunes or goes down to the Gulf, your taxes aren’t different. That’s because any land beyond those dunes can’t be developed. There’s nothing you can do with it, so those lands, owned or not, do not impact property values. The land value that determines the fair market value of these homes, thereby deciding how much tax should be paid for that land, is based on the amount of land owned at the Coast Construction Control Line. If both you and your neighbor have 180 feet of Gulf-facing land, and all things are equal with that land except that you own to the high mean-water line and your neighbor’s deed stops at the dunes, your land will have the same assessed value. Obviously, that doesn’t mean your taxes are the same. What you’ve put on that land will impact your value, as will dozens of other factors in the state of Florida, but owning a deed to the beach’s dry sand doesn’t increase the value at all. It’s worthless. The debates about customary use, property rights, use of eminent domain and public access to Florida’s beaches all continue to be appropriate. But it’s time to stop pretending any of this is about taxes. DUNE ALLEN BEACH — The Turgeon family from New Orleans was sitting on the beach on a hot Tuesday morning watching their young children play in the sand, when they were approached by a Walton County sheriff’s deputy. The deputy had been called by homeowners in Vizcaya, a multimillion dollar gated beachfront community, who wanted to enforce trespassing laws on the beach in front of their homes. The Turgeon family, who said they were confused about signage and were unaware of where the “public” beach met the “private,” was one of many caught in the crosshairs of the new customary use law that went into effect July 1. 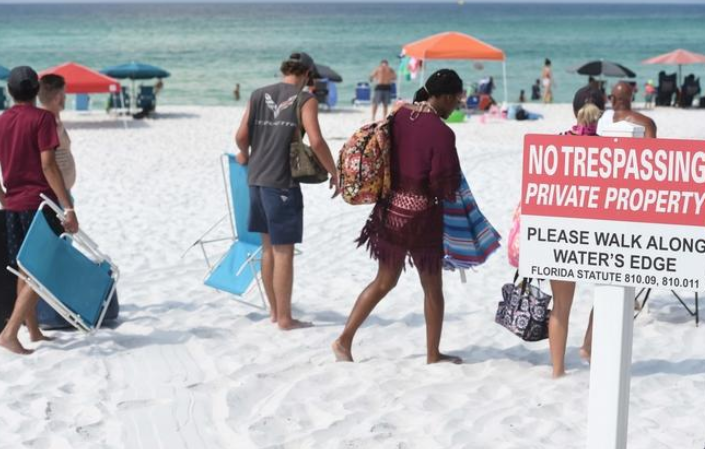 The law, called House Bill 631, essentially voids Walton County’s customary use ordinance and allows private property owners the right to claim the beach in front of their homes as private property, up to the mean high water mark, or wet sand. Homeowners in the Vizcaya neighborhood have been perhaps the most vocal supporters of the new law in Walton County, and Bill Hackmeyer, a property owner and Homeowners Association president, is a big part of the reason why.